Here are the 7 figures and 1 micro ship that come in this series. 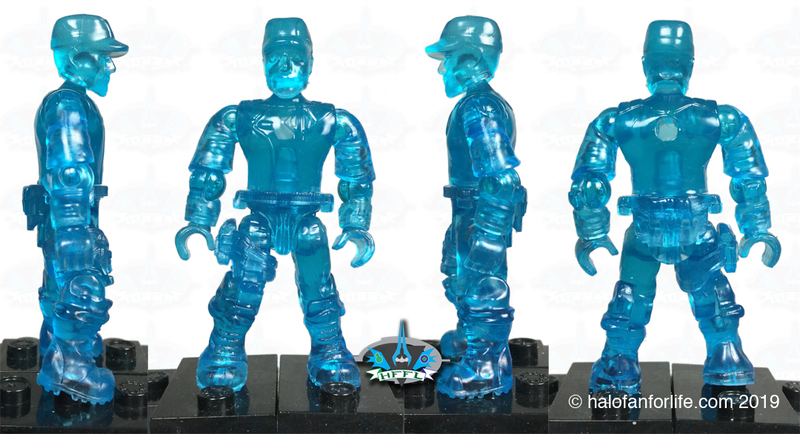 A translucent Blue (Holographic) Captain Cutter and Banished Grunt are the rare figures in this series. The micro Spirit of Fire is the Ultra Rare of course. The rest of the figures are common. Personally, I’d rather have had the Elite be rare and the Grunt be common as I want to army build the Grunt. Let’s take a look at the individual figures, shall we? 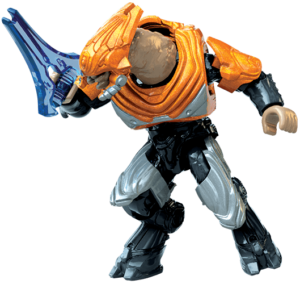 Oh, before I go forward, each individual action shot of the figure is directly from Mega’s website. It’s their computer generated model and not the actual figure, which you see right after in my orthogonal view graphics. Note the color shift of some of the figures. My pics reflect the retail figures under normal lighting, while the Mega pics are enhanced for optimum viewing. 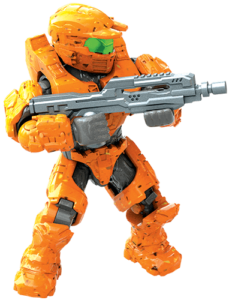 The Orange Mark IV Spartan comes with a Battle Rifle without a scope. Both the Orange and the Cyan Mark IV are the exact same figure, just different colors. The orange color is really more of a orange-yellow color. Great to use as a Grifball Spartan. As you can see it has a Green visor. 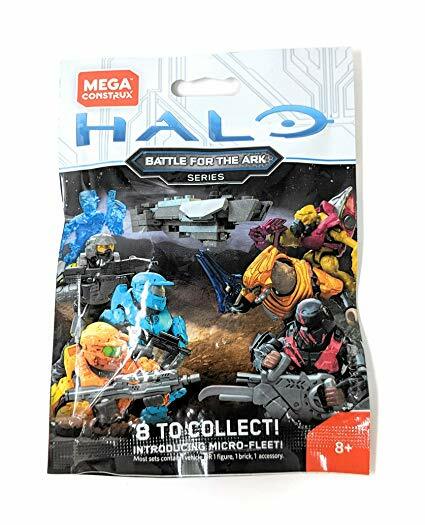 the inclusion of both Mark IV Spartans is a nod to Red Team who appear in the Halo Wars games and are stationed aboard the Spirit of Fire battleship. 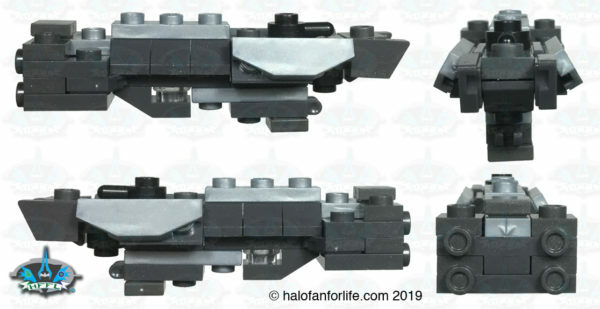 Do note that the shoulder armor pieces are different from each other. The Marine comes with a standard Assault Rifle. Always a good additional to any blind bag series, the UNSC Marine allows for a great army builder in fairly standard colors. The visor isn’t quite as rich in color on the actual figure. One thing I do wish Mega would start doing again is including backpacks. I miss those little things. LOL! I’m happy that this is a common figure as I really like to army build marines. 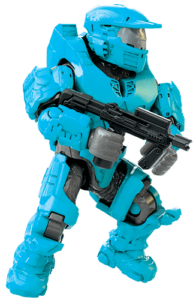 The Cyan Mark IV Spartan comes with a standard SMG. I’m a fan of this color, even if it may not seem practical on Spartan armor. 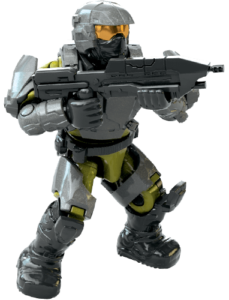 The Cyan Spartan has a silver visor. 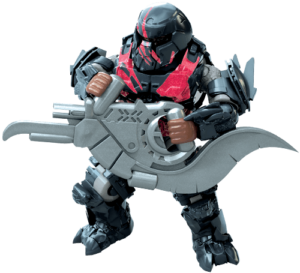 The Banished Brute comes with a Brute Shot which is a fairly rare weapon these days. As you can see the red on the figure is more crimson than bright red. I like that better though. We’ve had very similar releases of this Brute before. Personally, I think this is one of the best versions and am happy to see it again! It’s a decent army builder. Though I do hope one day Mega will upsize the Brutes to be their correct height. That being slightly taller than Elites and a bit more bulky. 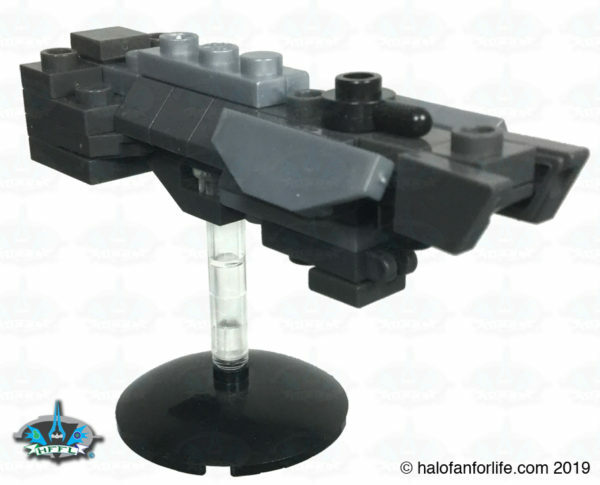 The Banished Elite comes with an Energy Sword, though it’s not quite as steely blue with the action figure as it is in the pic above. 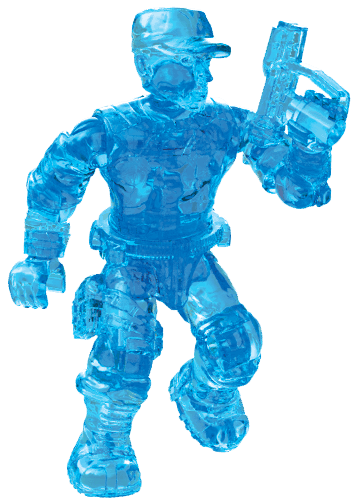 I’m ALWAYS happy when there is a translucent figure. I LOVE see-through toys! Cutter comes with a Magnum, which is also translucent. I was actually a bit surprised when I heard the announcement that Cutter was going to be in this wave, since he had already been in the Heroes series. However, when I found out this one was translucent, I thought it made sense. For me anyway, this figure is a high point in the “Battle for the Ark” blind bag series. I actually find this slightly superior to the Heroes version as there is no concern for the off-color of the uniform (as there was in the Heroes version). 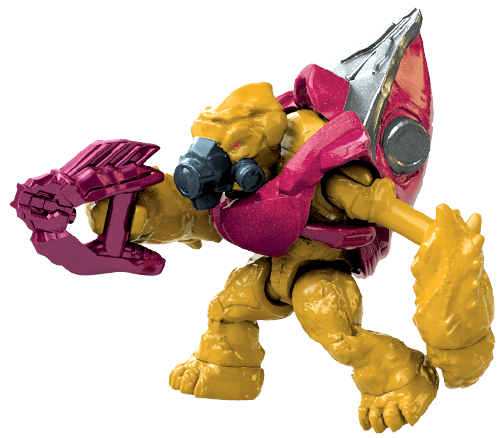 The Banished Grunt comes with a crimson color Needler. Oh how I wish this were common! We rarely get this style of Grunt these days and I want to army build the heck out of it. Being rare, it will be harder to do that. Sigh… Always a good figure to have though. Can’t have enough Grunts, right? Now to the absolute GEM of the “Battle for the Ark” blind bag series. The micro Spirit of Fire! The Spirit of Fire comes with 38 pieces, including the stand. It’s a very quick build. 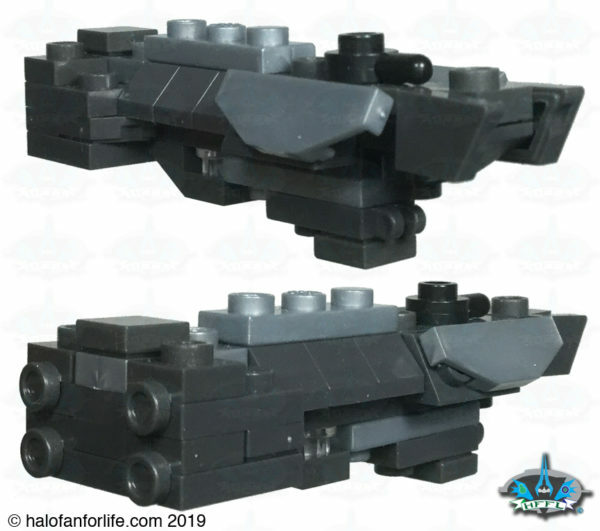 I’m surprised with the accuracy of this micro build, given the small size and limited parts to make it. It’s awesome! 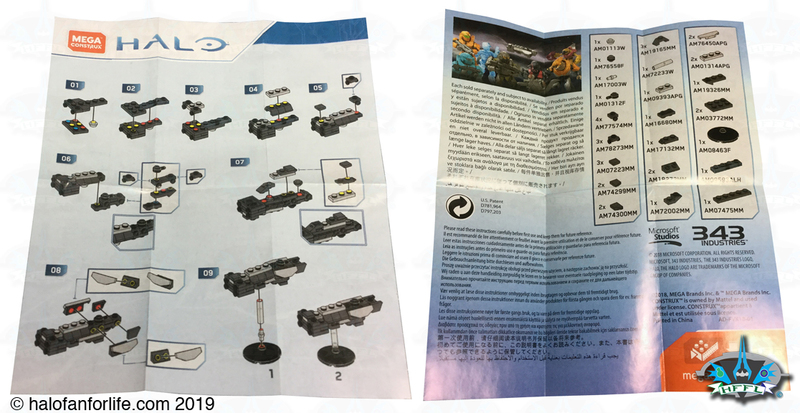 I’ve included the instruction sheet below so you can see how it’s built as well as the parts list. Most parts are standard, however, I believe there are one if not two parts that are exclusive to this set (as of this writing). Here’s the Spirit of Fire in orthogonal views, without the stand. Really a stellar job here. 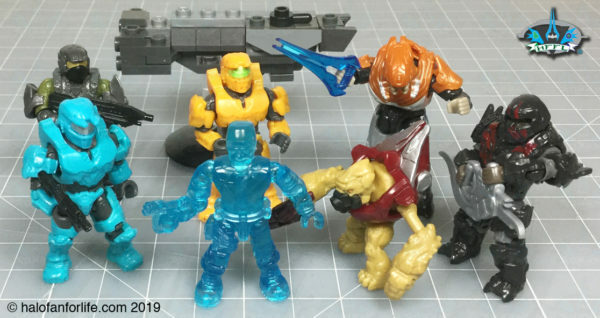 I’m a fan of micro builds, and word has it there will be a micro build in each blind bag series from here on. That remains to be seen, but I do hope that’s the case! Three-quarter views show more detail and help bring to life the epicness of this micro build! Do I recommend it? Absolutely! The Marine, Brute and Grunt as great for army builders. Cutter as a named figure and translucent at that is a high point for me in this series. My only issue is of the Elite being common and the Grunt being rare. Should have switched that. The Spartans at this point are a bit over done. But as they fit with the theme of the Battle for the Ark series, it makes sense.